I have to admit I'm a bit of fiend when it comes to shopping catalogues. One that always catches my eye when it drops out of the weekend newspaper supplements is the Museum Selection. Since 2002 they have been sourcing the best of products from museums and galleries and selling them under one collection. I find shopping a real hassle these days with little time to spare and two children to take with me. With cards, books, jewellery, homewares and food gifts to choose from your Christmas shopping could be sorted in one go with the Museum Selection. Bearing this in mind I have teamed up with Museum Selection to offer one reader of JibberJabberUK the chance to win a 6 Honey Selection Box. 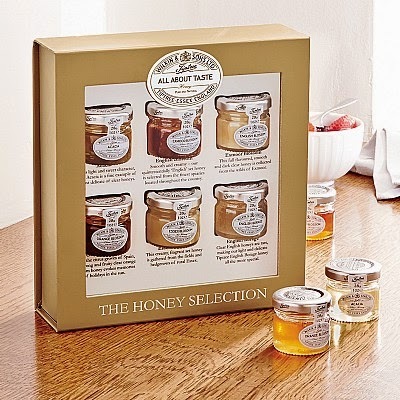 This is a special collection of Wilkin and Sons' English honeys. All entry methods are optional. If you leave a comment as 'Anonymous' please put you name in the comment box or some means of identification otherwise I can't validate your entry. All other entry methods are optional but they will increase your chances of winning. You can gain a bonus entry every day by tweeting about the giveaway. The winners will be contacted via email by JibberJabberUK and the prize will be sent to you from Museum Selection. The winner will be chosen using the Rafflecopter random number generator. If you haven't used Rafflecopter before then please watch this quick video. Promotion runs from Wednesday 5th November 2014 and all entries must be received by Midnight (GMT) on Wednesday 19th November 2014 (evening of 19th November and 20th November 2014) at the latest. Winners will be drawn at random via the Rafflecopter widget at the end of the promotion. The winner's email address and postage address will be passed onto Museum for the purposes of delivering the prizes. If a prize remains unclaimed after reasonable efforts have been made to contact the winner the promoter (Museum Selection) will be entitled to dispose of the prize as it sees fit without any liability to the winner for having done so. The promoter reserves the right to substitute or amend the prize if a product is unavailable. Prize draws are open to UK residents aged 18 or over only. The winners can choose to deliver the prize anywhere within the UK. I would love a new watch-managed to break mine! I am hoping for a cultured pearl necklace if Santa is feeling generous. I would love a new winter coat. A pair of leather boots. A new super fast computer. All I want for Christmas is to spend a nice day with my family most of which I don`t get to see that often. New glasses so i can see properly! A new laptop as mine is on its last legs!! A bottle of Madamoiselle Coco perfume by Chanel would be lovely. Very unlikely though! A new garden fork as I've just broken one! A new suitcase .... and somewhere to take it ! Socks! Christmas wouldn't be Christmas without new socks. A new charm for my bracelet! I have no idea....... But I think I need a course for taking food photos inside and I am fast wishing I had a slow cooker!!! I'd love another Jo Malone perfume. I want our new baby grandson to be healthy and well, above all else. Some perfume would be nice. I want a pile of new books and lots of bubblebath. Money for clothes shopping and a nice surprise. Elaine Clark. One of these new laptops that look like tablets that you can add the key board too. I want to go to Lapland! A nice peaceful family Christmas and some new books to read. An iPad would be wonderful. For Christmas I would love to get a new powered wheelchair. I would like a phone! To finish early enough on Christmas Day to get home for Doctor Who! A new car.. I can only dream! I'd like a set of nice fragrances. A Mini iPad would be great! An Orla Kiely bag wouldn't go amiss! for my mum to have a good one because shes got me through so much this year. A set of alloy wheels for my car! Honestly, I just want to be able to eat again! A pair of fab knee-high boots that I have been hinting about for the last month or so! I'd really like some new pjs and cosy slippers!!! An old fashioned address book - something I never remember to buy myself! I have 2 blu-rays on my wishlist for christmas viewing hopefully: T S Spivet and The Grand Budapest Hotel! Uriah Heep's latest DVD, Saxon's latest DVD, Flying Colors' latest album and Billy Idol's autobiography.